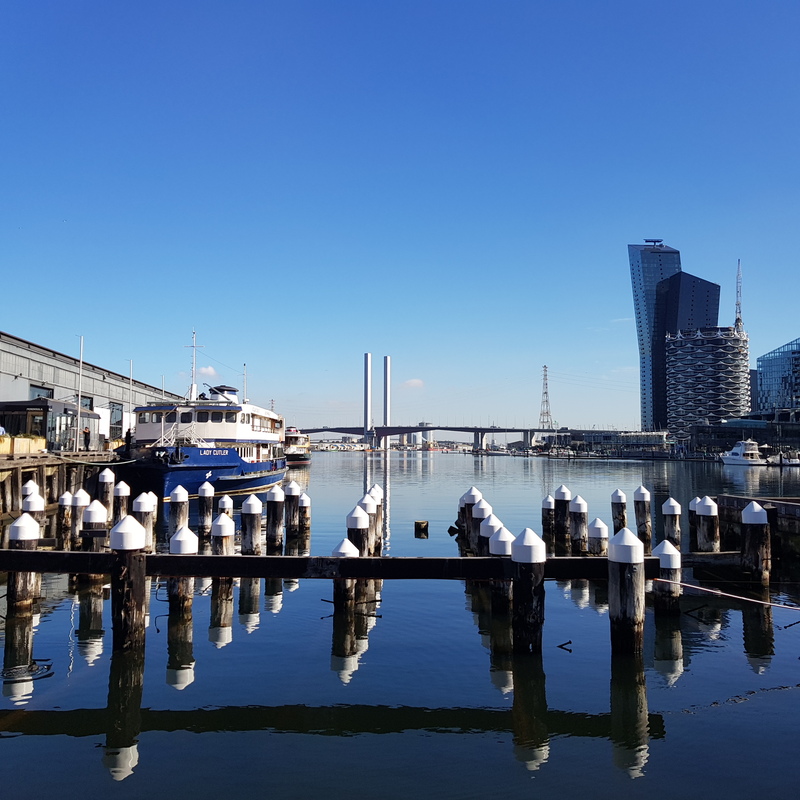 Part three follows on from the part one: Yarra's Edge and part two: Victoria Harbour. 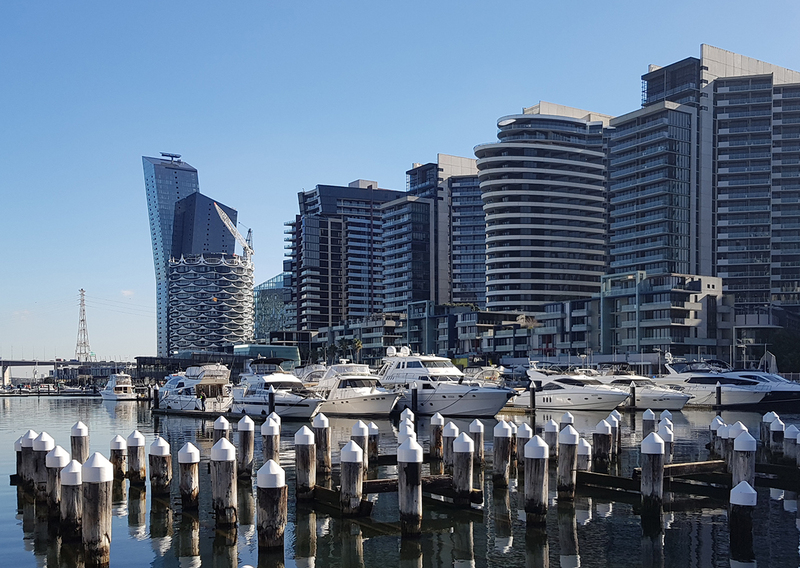 The focus of today's piece will be NewQuay and Harbour Town, the northern most precincts within Docklands. NewQuay was the first precinct to open way back in 2003 and has probably evolved the most. 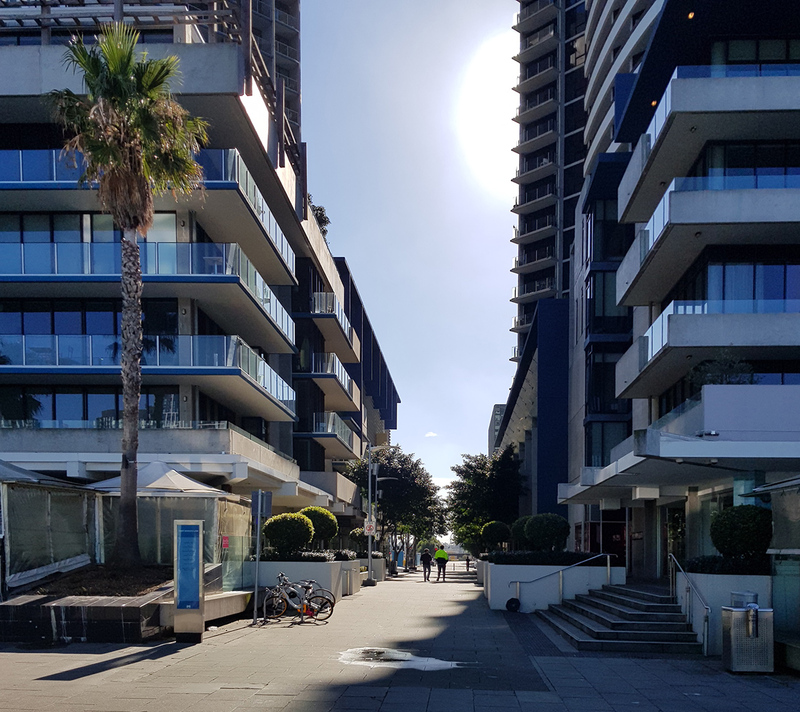 Initially comprising of two parts (east and west) bisected by the former Waterfront City precinct, NewQuay now stretches the length of the northern edge of Victoria Harbour with the construction of NewQuay Central featuring five buildings designed by three different architects. 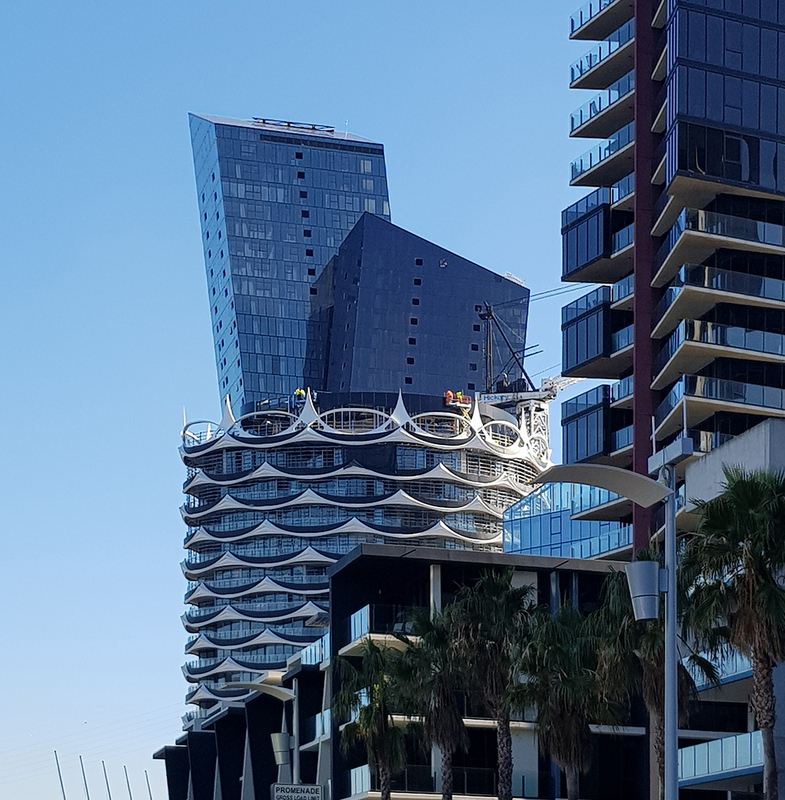 Marina Tower, Banksia and Promenade form the link between east and west. 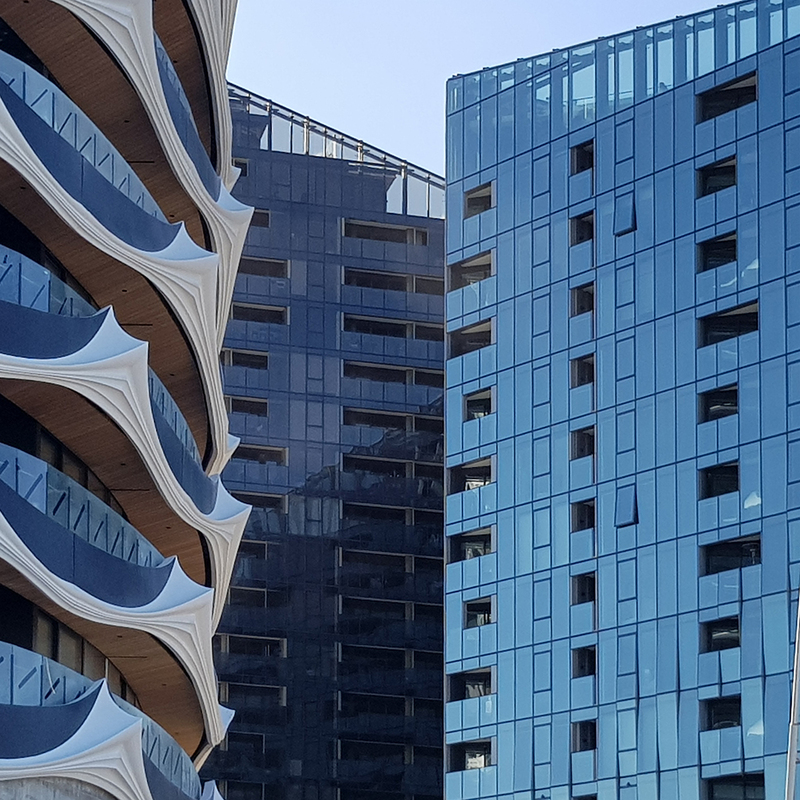 This is a departure from the early days when Fender Katsalidis and SJB formed a partnership to design the first five residential buildings in the precinct which led to the formation of Plus Architecture who designed the sixth building Harbour One. 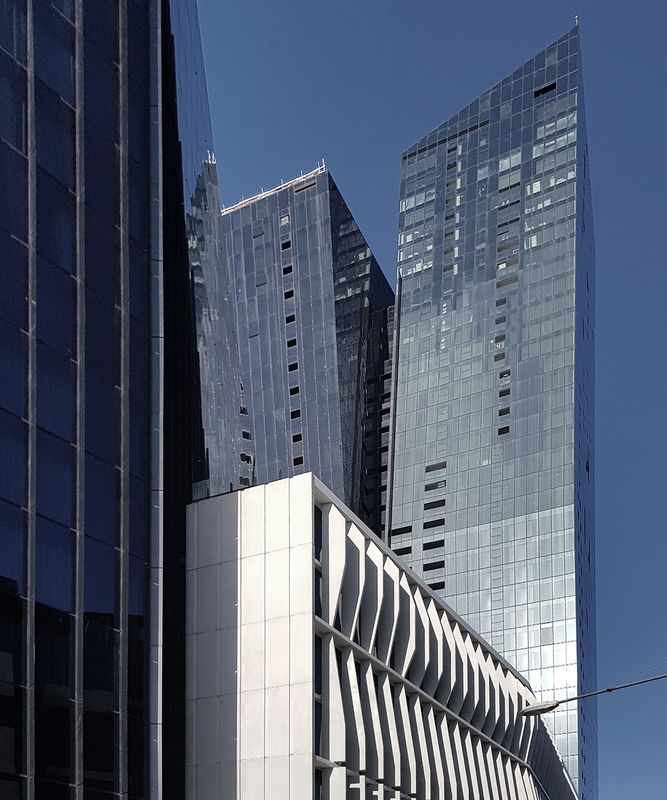 The earlier buildings all shared a similar aesthetic with variants on the same building form and materiality and were named in honour of artists and architects. 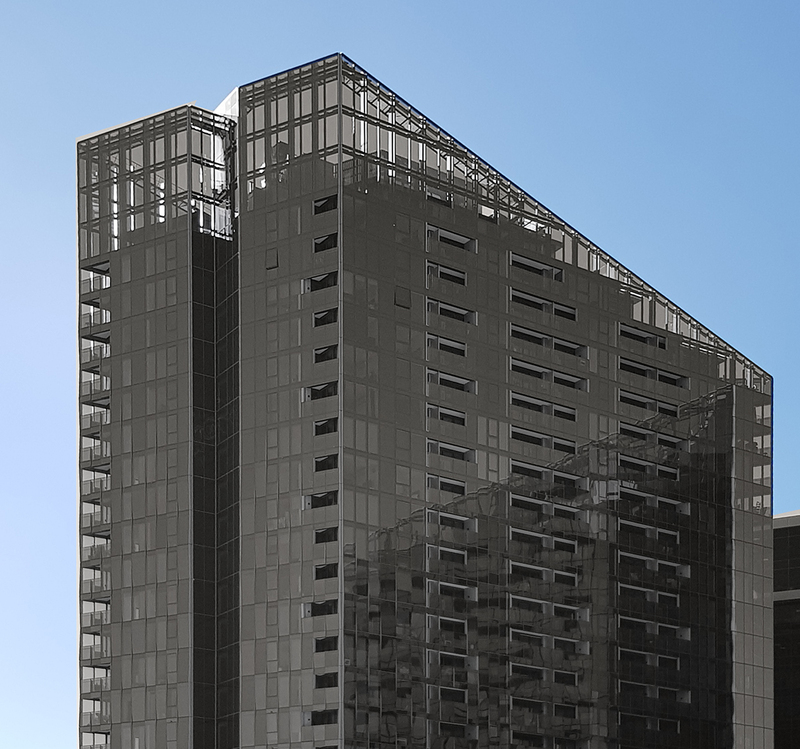 Each tower sits atop an expansive podium with rooftop resident gardens and retail to ground floor. The restaurant and bars feature both indoor and outdoor seating fronting the promenade although the plastic weatherproofed coverings are beginning to show their age and I wonder if it might be worth building something a bit more permanent like a pergola structure with a better relationship and stronger connection with the promenade. Southgate and Riverside Quay provide some good examples of how this can be achieved. I'd also consider going a step further and replacing the palms with trees that provide better wind protection. A glimpse from the promenade down a side street. 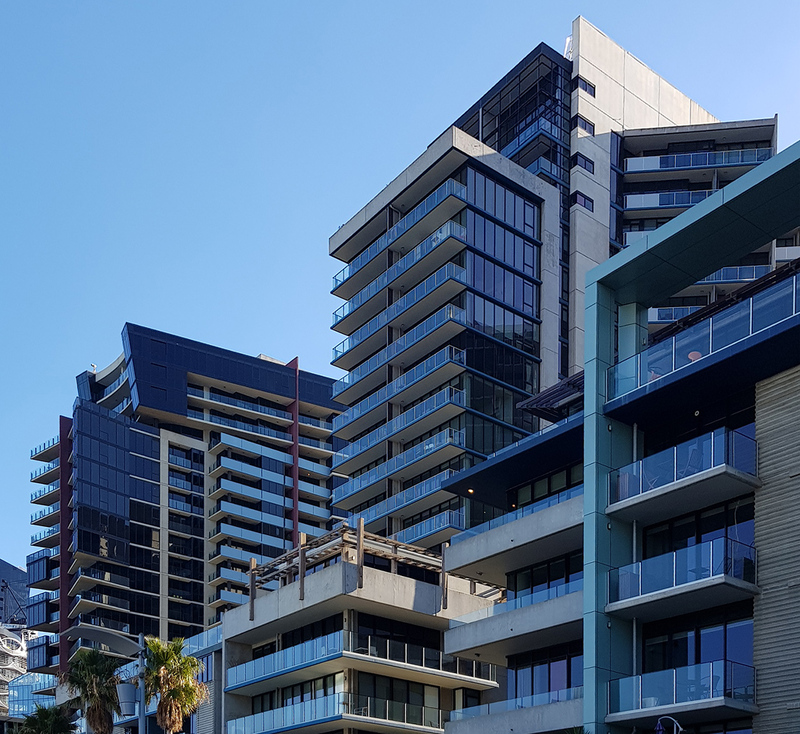 McBride Charles Ryan's The Quay's was the first development to break the mould of earlier developments save for maybe The Conder and saw a variation in architecture and built form. 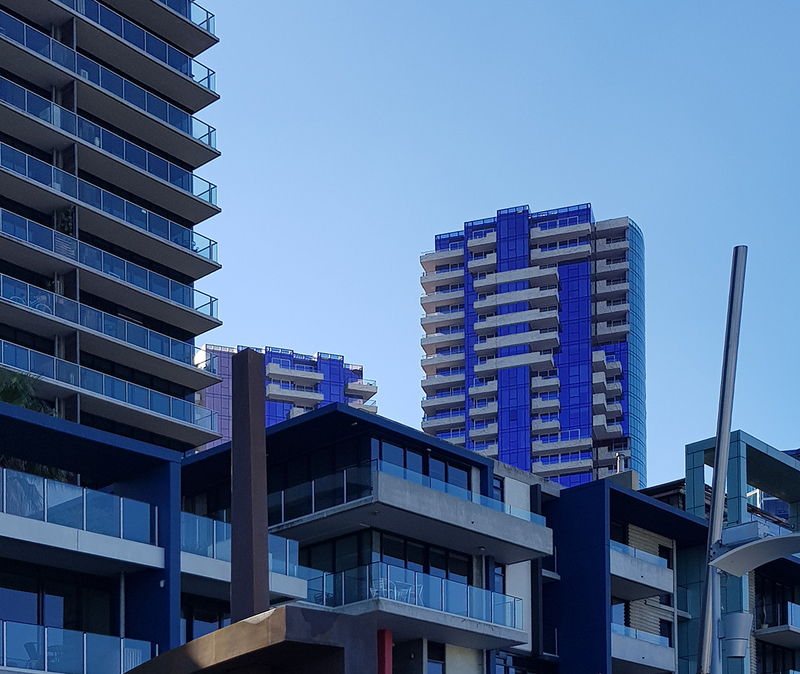 The introduction of pinks and purples provide a contrast to the more robust concrete grey of the earlier developments with a kaleidoscope of colours and materials at ground street level creating one of the more unique streetscapes in the area. 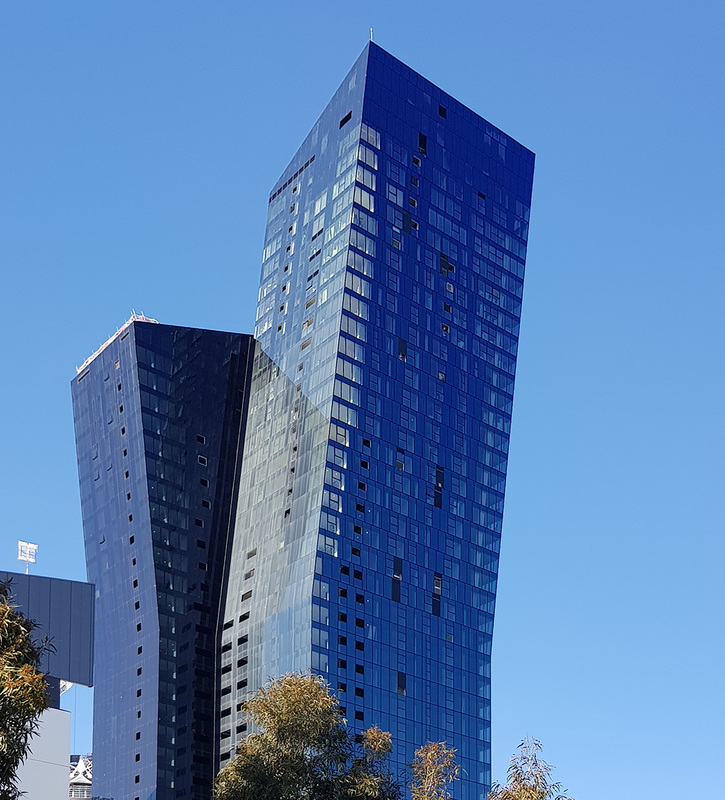 The towers themselves are unique to not only Docklands but also Melbourne with glazing combining with crumpled balcony spandrels providing visual interest to the facades. 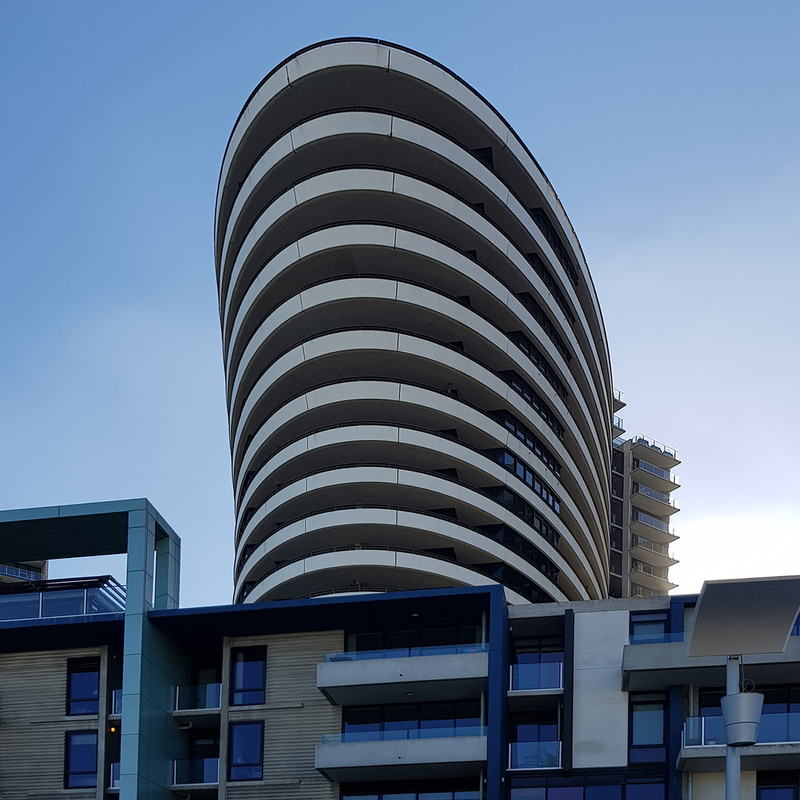 The more recent buildings which form part of NewQuay Central have followed the trend away from the archetypal model of the earlier buildings particularly with materiality and roof forms. 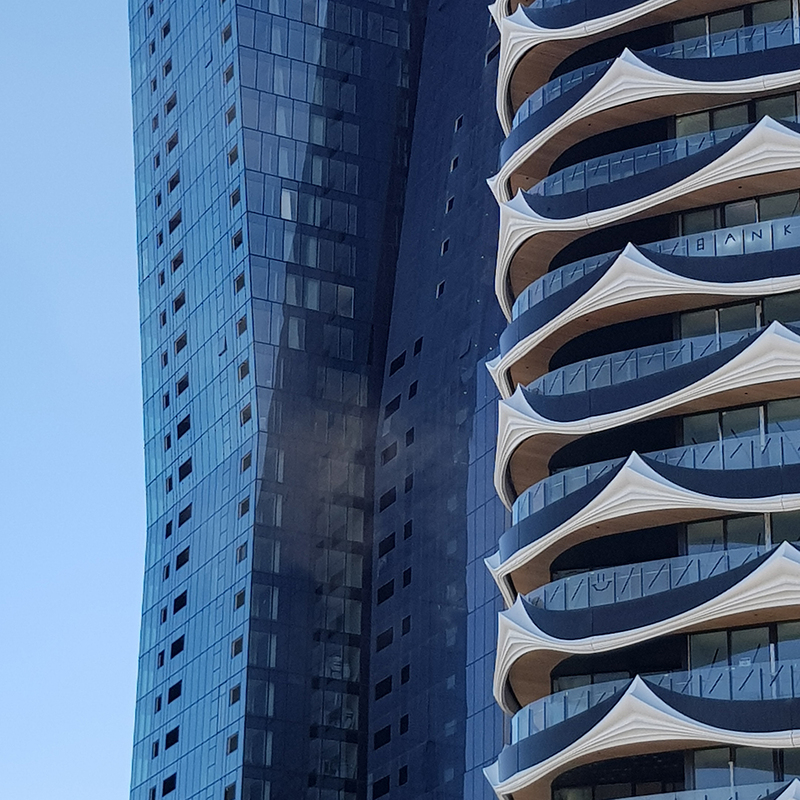 This can probably be largely attributed to the fact three different architecture firms designed the buildings with DKO's Marina Tower and Woods Bagot's Aqui and Promenade favouring a series of crystalline or shard buildings with sloping roof forms and different tones of glazing. 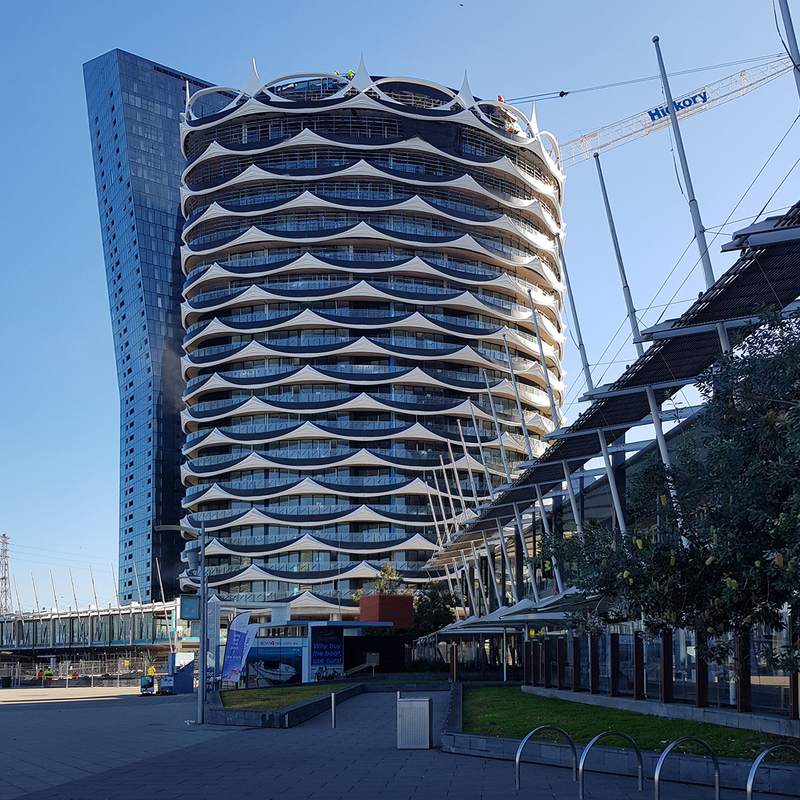 MCR's Banksia building is reminiscent of Chicago's Marina Towers with its GFRP facade drawing on the waterside location providing a series of detailed 3d waves wrapping the building and providing a central point of interest, contrasting well with the other NewQuay Central buildings and proving that variety is key. NewQuay Central introduces further variety to the built form and architecture with different architects designing the buildings. 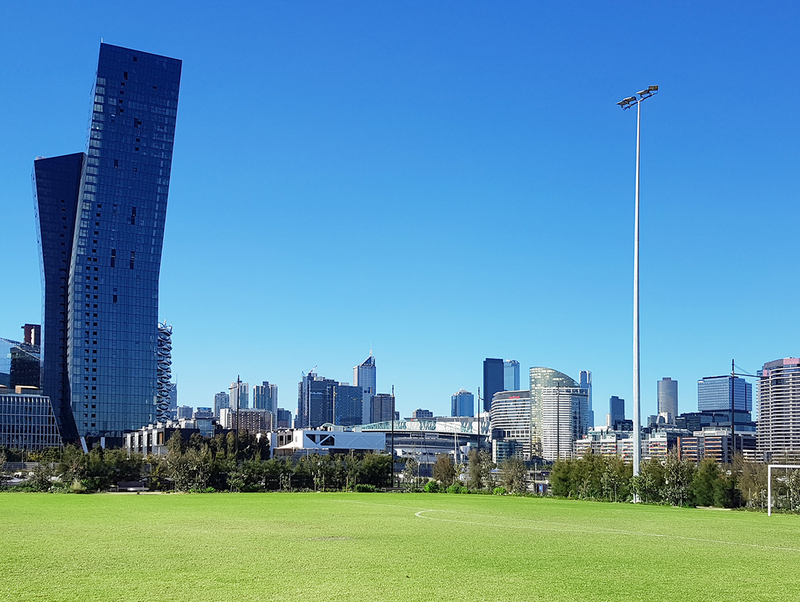 Up until recently NewQuay didn't have as much open space aside from the promenade but with Monument Park, Ron Barassi Snr Ovel and the soon to be completed NewQuay Park that has changed. 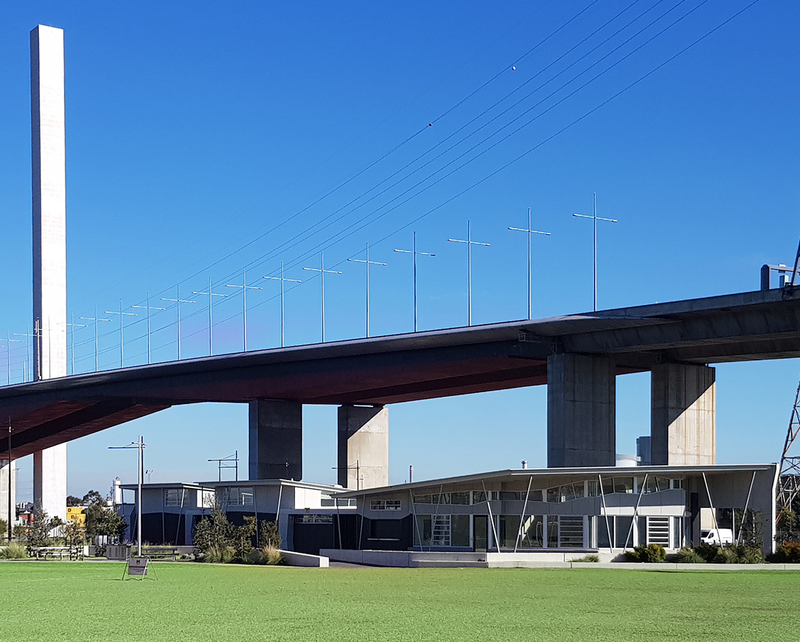 Located to the rear of the soon-to-be completed Banksia development, New Quay Park will provide a sloping north facing green space for NewQuay's growing population and visitors while concealing the underground parking for Banksia. 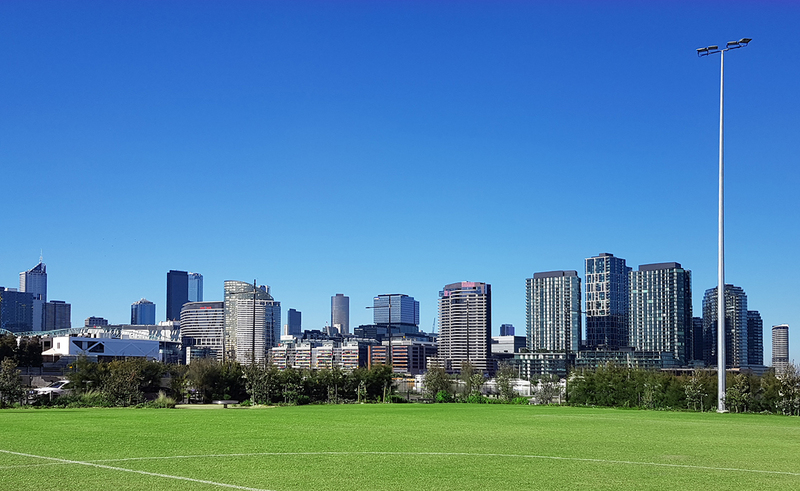 The park replaces a previously paved surface which for a few years hosted a temporary tent structure and was at one stage going to host a Vegemite museum. I think it's fair to say the park is the better outcome. 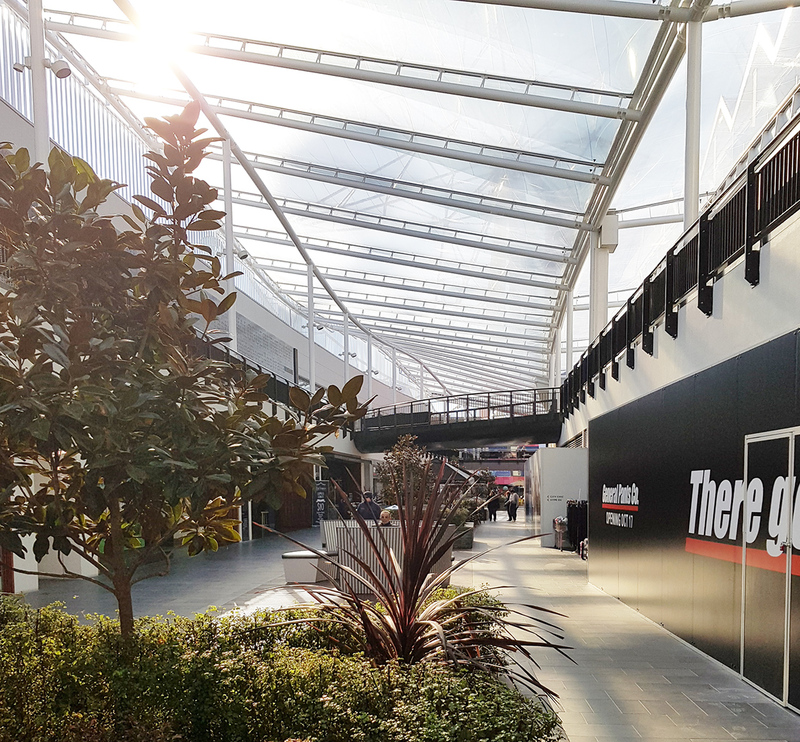 Ashe Morgan's purchase of the former Harbour Town retail and shopping precinct from ING has resulted in an ongoing transformation crating a quasi-shopping centre of sorts. The early stages have included an overhaul of shopfront facades and introduction of paving in lieu of exposed concrete aggregate finish with replacement of timber decking resulting in a much more consistent finish. 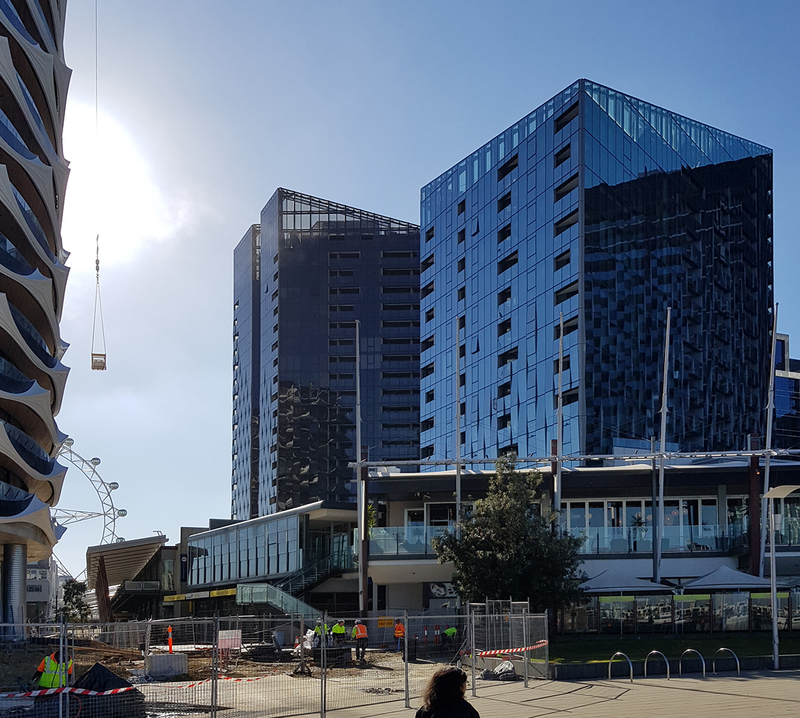 Future works will include a Hoyts Cinema designed by NH Architecture, with future works involving the creation of a fresh food market and fish market with additions to the facades to Docklands Drive. The fourth and final piece will cover Batman's Hill and surrounds. In the meantime further images of NewQuay and Harbour Town can be viewed in the slideshow below. 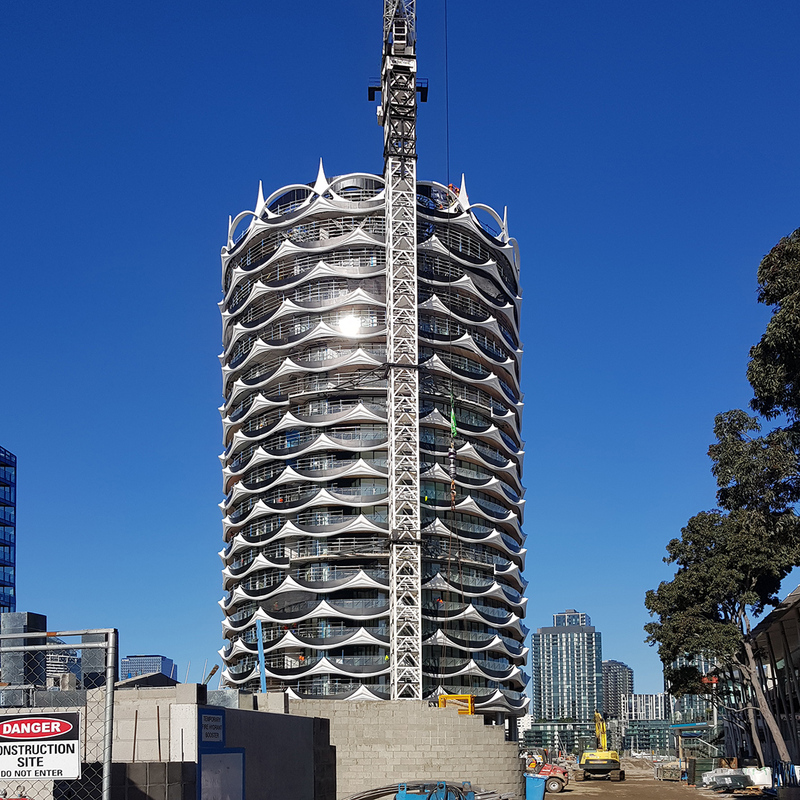 I wonder if there is more history to the area here and if so, where can we find a more detailed write up of the historical value of an area in the city? 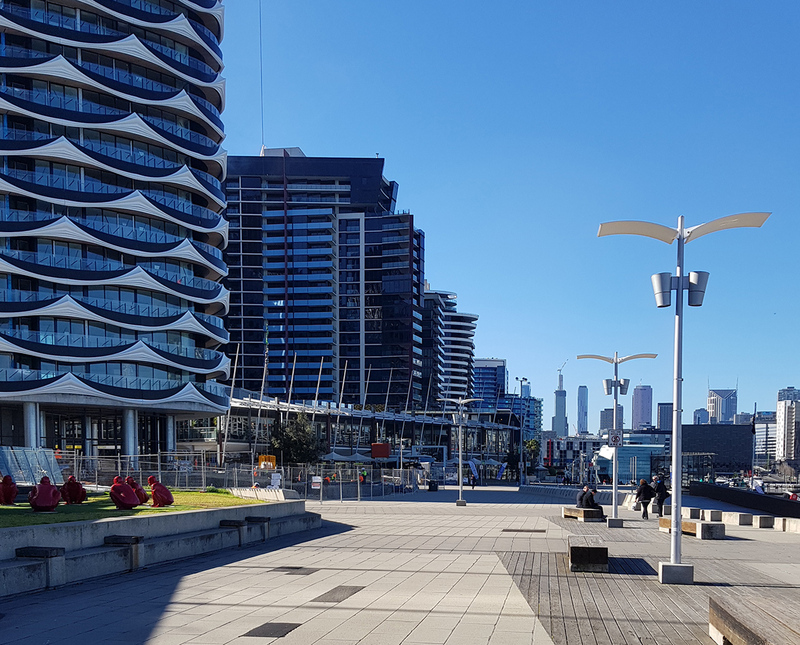 It would definitely give the place a little bit more character rather than focusing on the different types of developments that are moving in and out of the area.